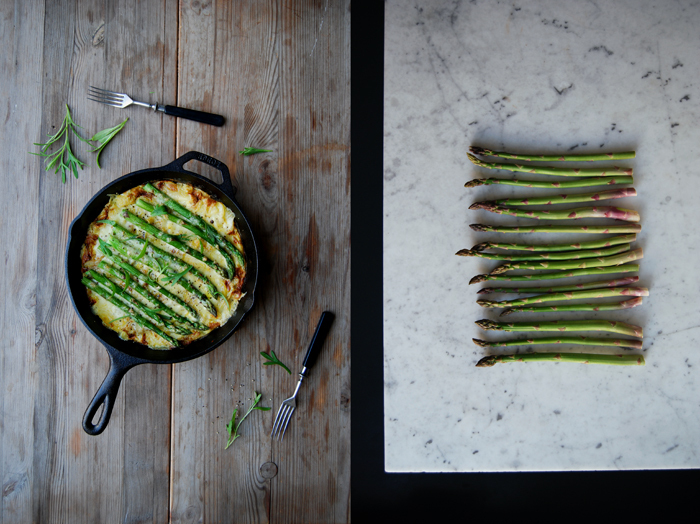 My first asparagus of the year found its way into my kitchen and I’m as excited as a kid on Easter morning. This is just the start, the beginning of the new season! I can’t help thinking of all the other delicious goods which are soon to follow: the first ramp leaves spreading their garlicky aroma in a bowl full of pesto, crunchy fava beans mixed with parmesan in a creamy risotto, juicy spring cucumber, so concentrated in flavour that some sour cream and dill is enough to throw a quick salad together and enjoy the purest and most simple pleasures of nature’s annual awakening. I don’t even want to imagine ripe tomatoes dripping juice, I’ve been missing them for so long and it’ll still be a little while before I can savour them. 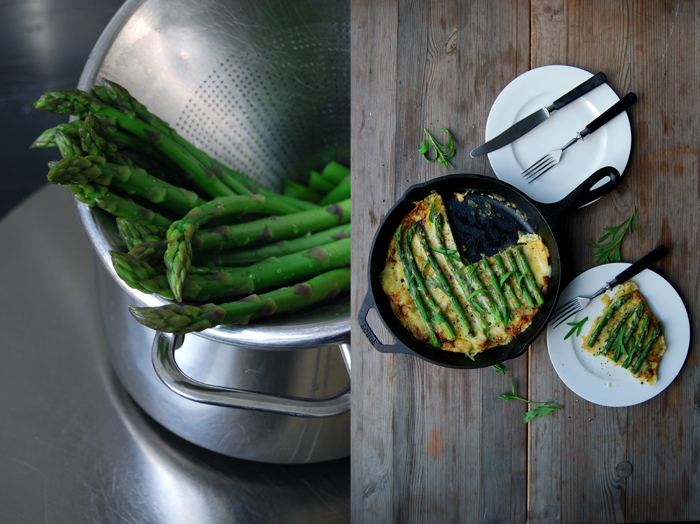 For now I’m just over the moon to have the pretty slim stalks of green asparagus back in my pan. 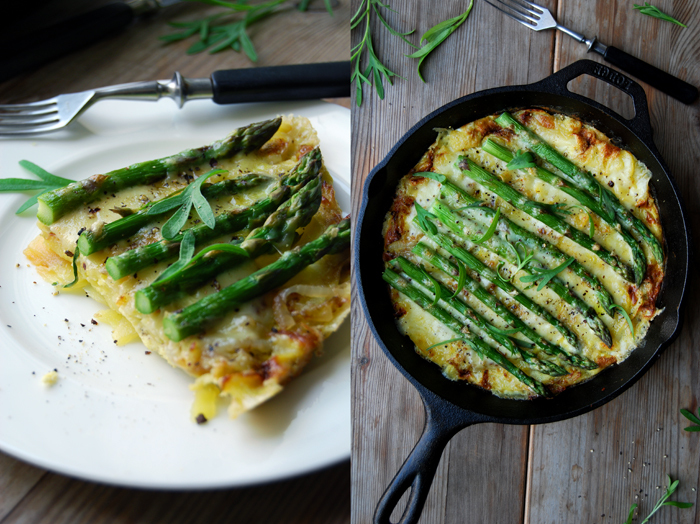 So two things were on my mind in the past few days which filled me with excitement in the kitchen: the first asparagus of 2015 and my brave decision to make a tortilla after I failed miserably at my first and last attempt more than 20 years ago. My potato omelette was burned on the outside and undone in the middle, a complete kitchen failure created at the beginning of my active culinary journey. 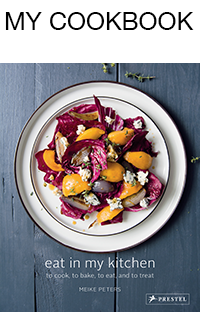 Somehow it had an intimidating effect on me considering how long it took to give this dish a second chance. 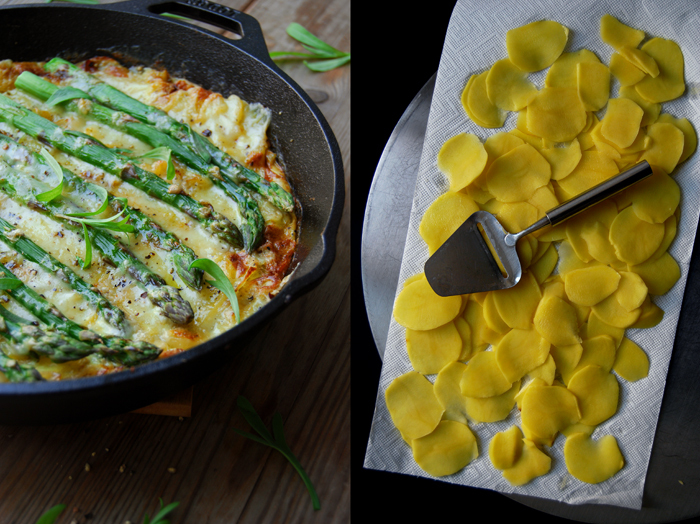 But now I felt ready to give it a go again, my asparagus and some fragrant tarragon at hand to vary this rich Spanish potato classic with some green freshness and a little grated mountain cheese (Swiss Appenzeller) to add its hearty flavours to the vegetables. It’s not as big a deal to get the potatoes right as I had imagined (or feared), the only trick is to find the right setting on your cooker. They should cook in the pan on medium heat while covered with a lid without turning black or mushy. It takes about 15 minutes and once they are done, you add some fried onions, eggs and asparagus and let the tortilla cook for a few minutes. 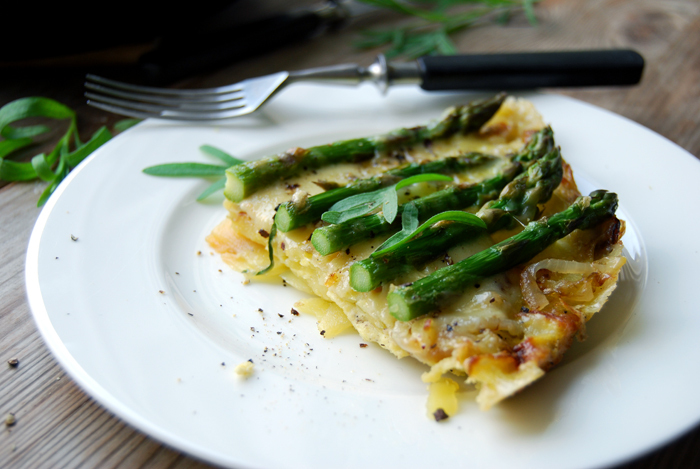 I finish it off under the grill to melt the mountain cheese which created a smokey crust on the asparagus. It worked so easily, my tortilla kitchen trauma is finally solved! Blanch the asparagus in boiling salted water for 1 1/2 minutes or until just al dente. Rinse with cold water, drain and set aside. Slice the potatoes very thinly with a cheese or mandoline slicer, spread them between kitchen paper and pat them dry. In a heavy pan (ovenproof, about 25 cm / 10″), heat a splash of olive oil and cook the onions on medium heat for a few minutes until soft, take them out of the pan and set them aside. Put the pan back on the heat and add a generous splash of olive oil. Spread the potato slices in the pan, close with a lid and cook for about 12 minutes on medium heat. Check the potatoes with a fork after 5-7 minutes by lifting them a little from the side, mind that they don’t burn and adjust the temperature if necessary. After 12 minutes, carefully turn the potatoes with a spatula (like a pancake) and spread the onions on top, give them another 2 minutes. Whisk the eggs with 1 teaspoon of salt, pepper and nutmeg and pour over the potatoes, close with a lid and cook for 2 minutes. 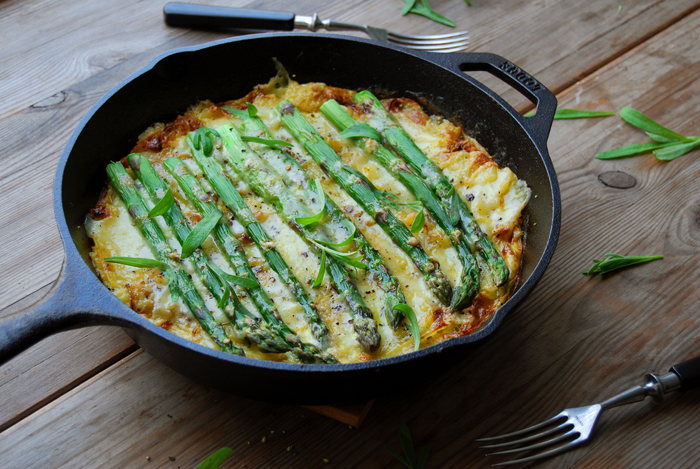 Arrange the asparagus on top of the eggs, close the lid again and cook for about 4 minutes or until the egg is set. Lay the grated cheese on top of the tortilla and put the pan under the grill for just a few minutes until the cheese starts to bubble. Sprinkle with tarragon and crushed black pepper before serving. Nothing better, this looks absolutely incredible! Perfect for this time of year. Thank you Matt! 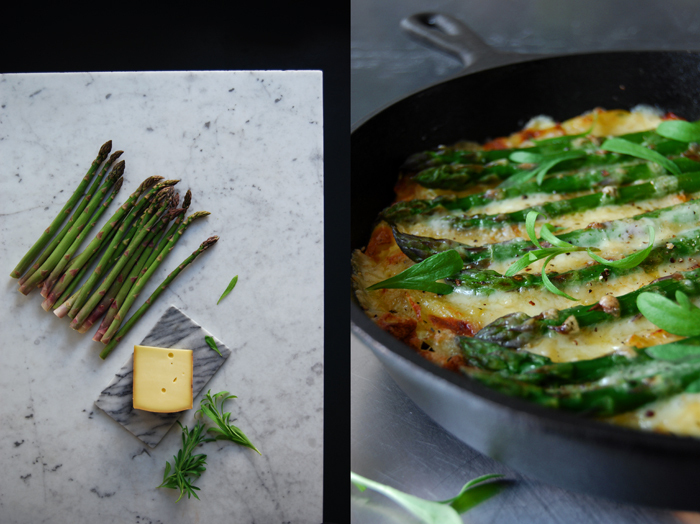 It felt so good to cook with asparagus again, I missed it!